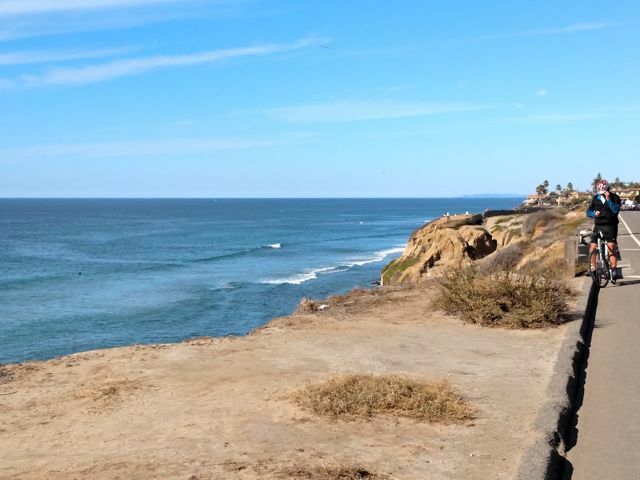 Perhaps the most popular cycling route in San Diego County is the coastal highway between Oceanside and Del Mar. 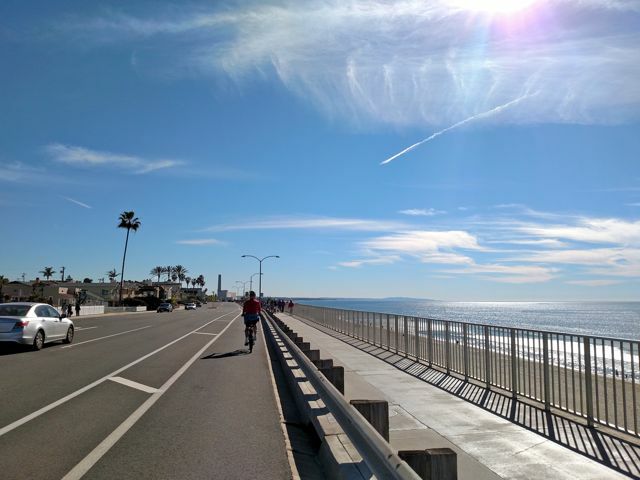 On weekends and holidays hordes of cyclists zip up and down the roadway, enjoying the ocean vistas and breezes. Riding southbound, the blue Pacific is ever present on your right and wide bike lanes make the route fairly safe. The terrain is mostly flat except for a view manageable grades. Navigating through the coastal cities is a bit trickier, but they have all installed either bike lanes or sharrows to help you along, and you can often escape down side streets to get off the main road. We also tend to duck into the two State Park campgrounds that run for long distances parallel to the roadway. 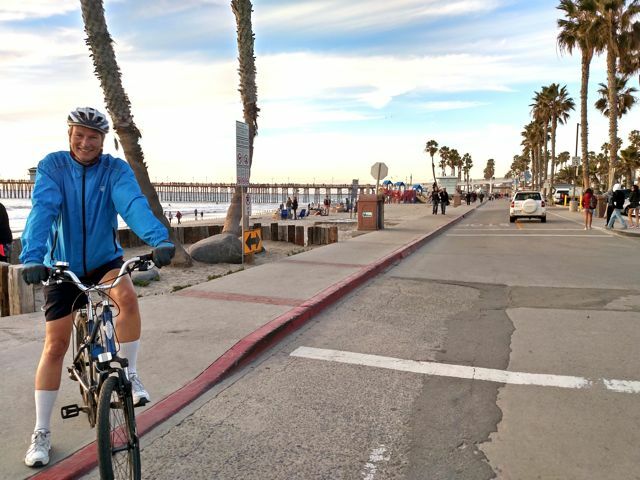 Steve and I started the New Year by cycling from Oceanside to Encinitas, a casual 14 mile ride. We started by following the Rail Trail route, a 44- mile work in progress as a combination of trails and on-road bike routes. It served us well through Oceanside, however in South Carlsbad we opted to stay along the coast rather than heading inland to follow that route. 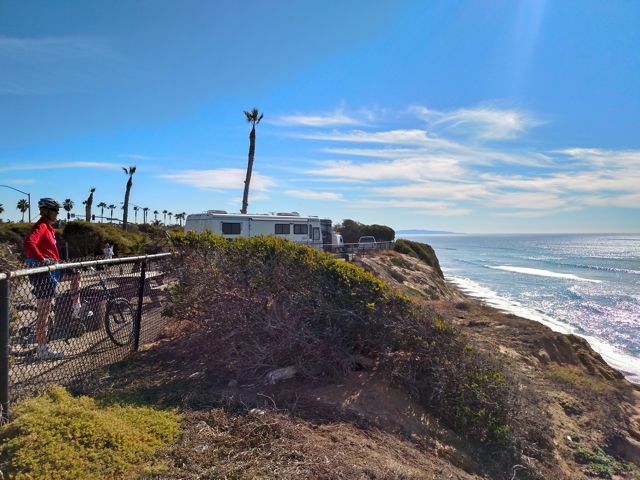 We stopped at the South Carlsbad State Beach campground and watched from the seaside cliffs as dolphins surfed the waves next to the humans. Weather was sunny and brisk but perfect for cycling. 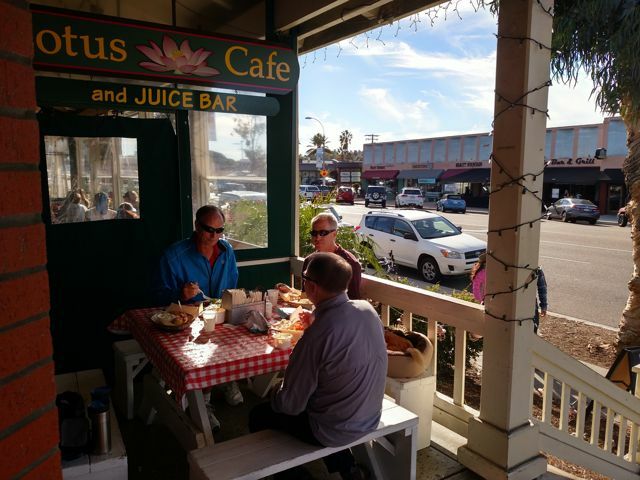 Dining choices are endless as you cycle through Carlsbad, South Carlsbad, and Encinitas, each with its own train station which is handy if you’d like to do a one-way ride. 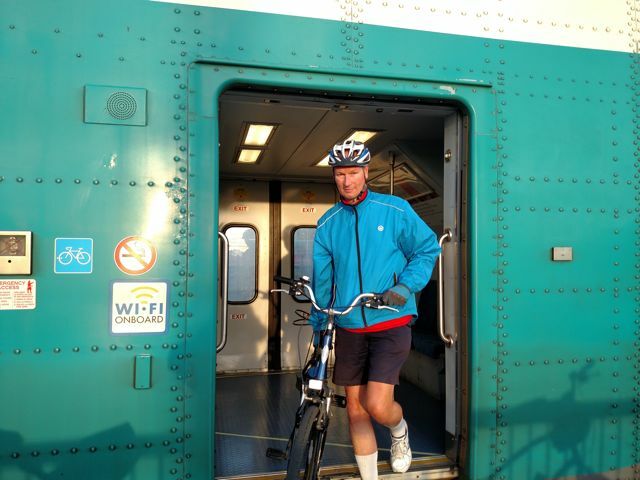 We love train travel, so it adds more fun to our bike trips. Farther along, Solana Beach has a station, but after that the next coastal station is downtown San Diego. 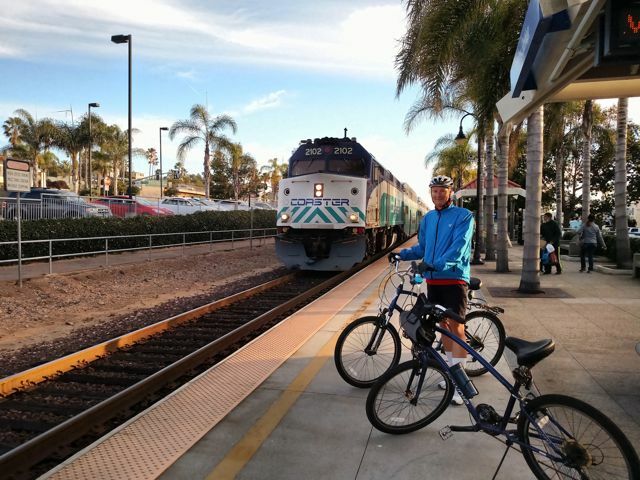 Certain Amtrak Surfliner trains stop at all stations, but a free reservation is required to take your bike along. The local Coaster line welcomes bikes on all of its trains. Look for a car with a bike insignia, which indicates it has spaces for two bikes. The fare between Oceanside and Solana Beach is only $4 since it is considered one zone. Weekend and holiday schedules are reduced, so some advanced planning is required. 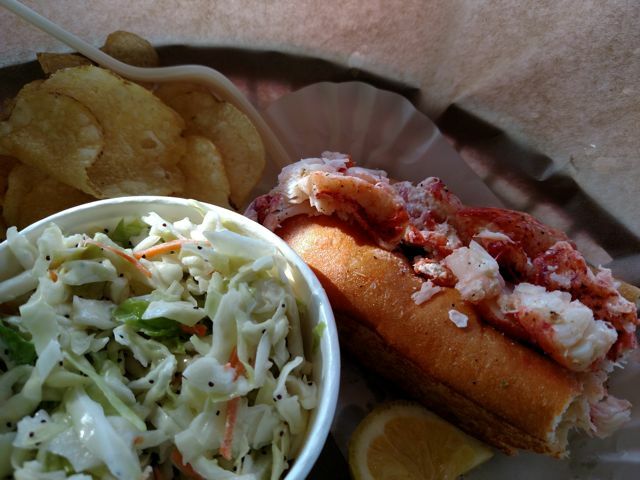 We met friends for an al fresco lunch at Lobster West in Encinitas, and started the New Year with their delicious lobster rolls. We then boarded a Coaster train and returned to Oceanside in about 20 minutes, in time for a spectacular sunset at the beach there. What a fantastic way to start the New Year! Class II biking along the coast highway in Carlsbad. Rich along Coast Highway near Carlsbad. 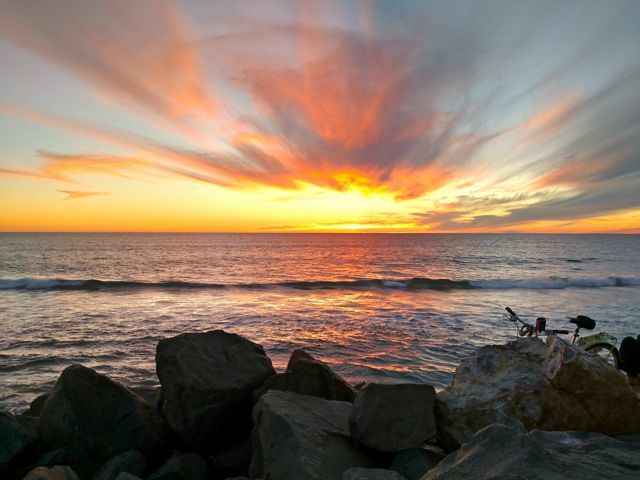 Campers at South Carlsbad State Beach, a great Camp ‘n Ride destination. Expensive and no hookups though. We watched as dolphins surfed the waves and chased fish while pelicans tried to grab them. Meeting with good friends for lunch at Lobster West in Encinitas. Closeup of Lobster West’s delicious lobster roll. Steve awaits the Coaster train at Encinitas station. 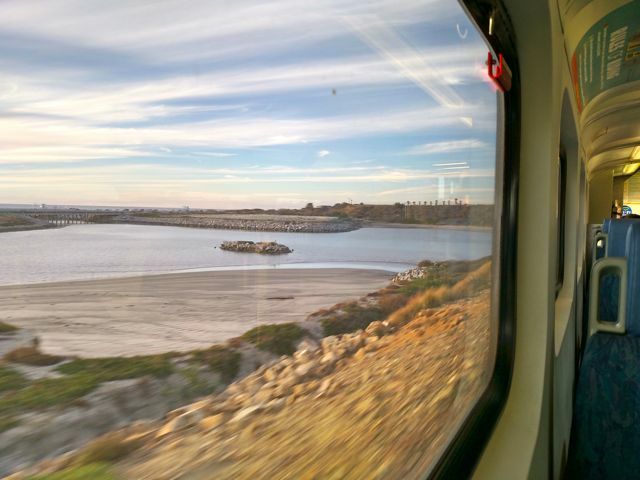 It’s only $4 fare to Oceanside. View from the Coaster window. Steve emerges from the Coaster car. Note the bike insignia. There was space for our two bikes on this car. Returning to Oceanside. Steve with the pier beyond. 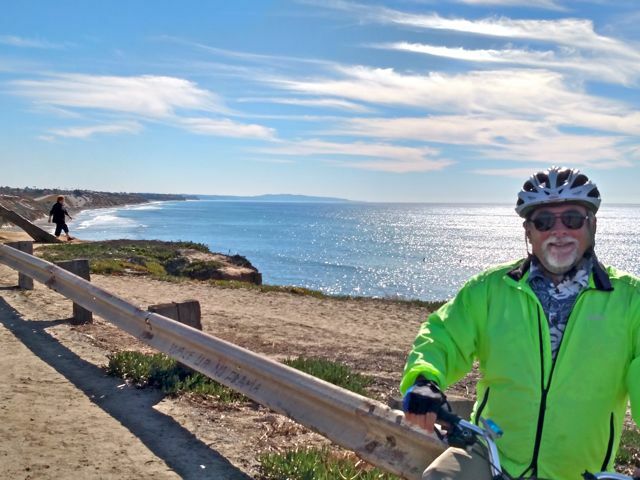 The easy scenic cycling adventures of Richard Fox, author of the 2014 (2nd Ed 2017) guidebook "enCYCLEpedia Southern California – The Best Easy Scenic Bike Rides."